This entry was posted on July 10, 2012 at 2:55 pm and is filed under BMDs, London, Marriage, Marriage certificate, Paternal. You can follow any responses to this entry through the RSS 2.0 feed. You can leave a response, or trackback from your own site. 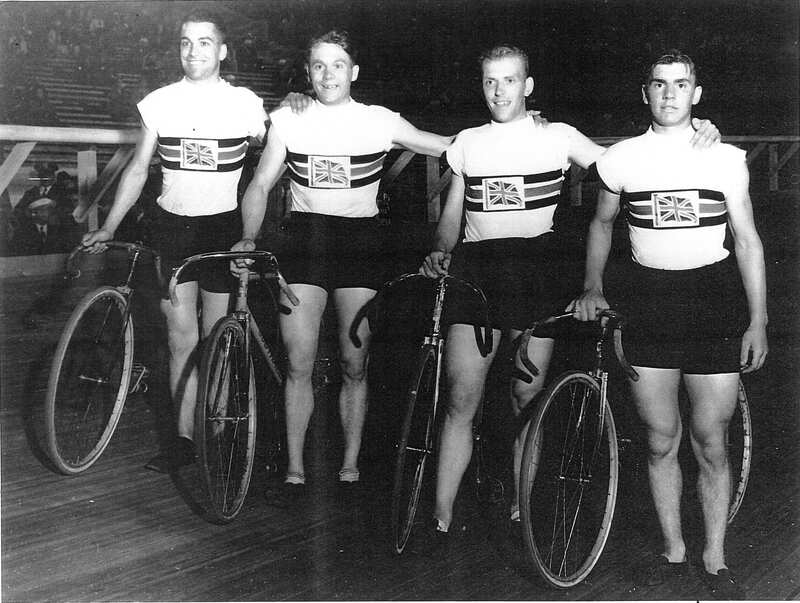 Ernie Johnson was a member of the Belle Vue Cycling Club when he competed at the Olympics. When he died his relatives donated his racing jersey and team cap for the club’s archives.They are currently on display at the Brooklands Motor Museum in Surrey as part of their special 2012 Olympic attractions. Thank you so much for letting me know, Steve. I’m definitely going to pay them a visit! 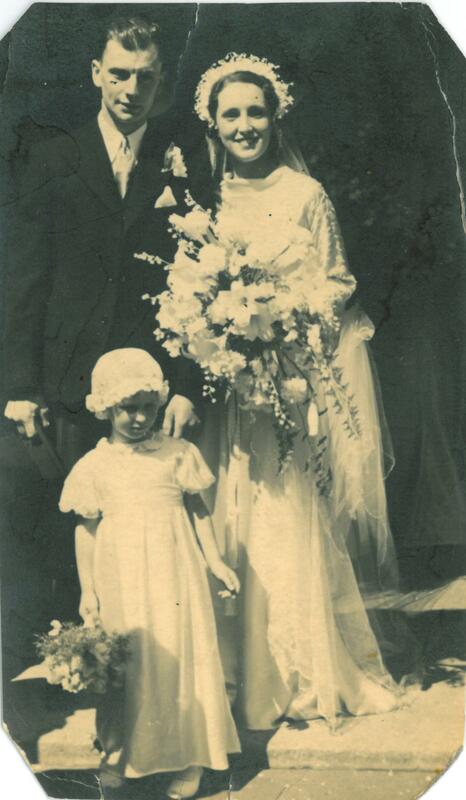 Was Ernest’s mother Rose Margaret by any chance? We always heard stories that our great-aunt had a son that participated in the olympics. 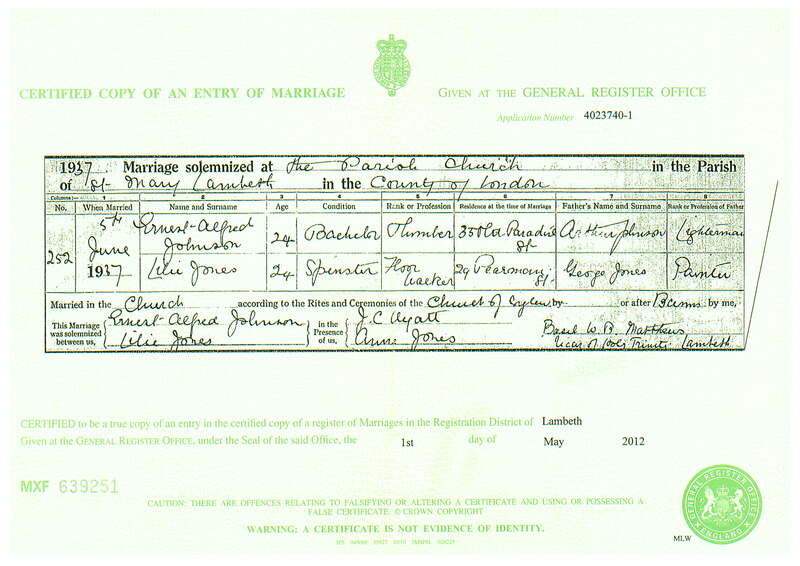 Hi Julie, I believe Ernest’s parents were Arthur William Johnson and Mary Magdalen Targett. Thanks for your response Amy. Looks like I need to keep searching for my olympic connection. Well done to your great-grandfather winning bronze for England. Hi Christine, thanks so much for commenting! I may have to take a trip to Dorking Museum to see these – thanks very much for letting me know. That’s very kind of you, thank you! I’ll send you an email when I plan a visit. Summerfield and I have 18 of his medals,including the Gold for this record, a Brooklands enamel badge and 2 Bell Vue lapel buttons. Hi Jenny, thanks so much for commenting. This is completely new information for me – very interesting! Do you have any documents about the club record at all? I haven’t got any but I will ask my brother and sister.I do remember there being a wooden plaque with metal front. It was still about when my father died in 1999.and if it still exists I will try and get a photo for you. Have you found any archives for the Belle Vue club? How exciting! Thanks so much for looking for me. I’ve just emailed you using the email address you’ve registered on WordPress with – please let me know if it doesn’t work for any reason and I’ll try again.